One may ask, “how a tool built for Guatemala can work in Afghanistan?” This is a fair question, given the risks inherent in the differences in language, culture, and expectations of an interface. Additionally, from an institutional standpoint, we’re dealing with distinct systems of incentives, governance, and decision-making. We view these differences as features of our process as opposed to impediments. In fact, they are the foundations of our approach—which we call citizen-centered design. In essence, we’re taking the core architecture of the MiMuni app in Guatemala and, through our design process, applying an ethnographic lens to create a new application that represents Afghan culture, technology trends, and models specific aspects of the relationship between citizens and their local government. First of all, we recruited a dynamite local project manager, who is a quick learner, skilled networker, and strong relationship manager. 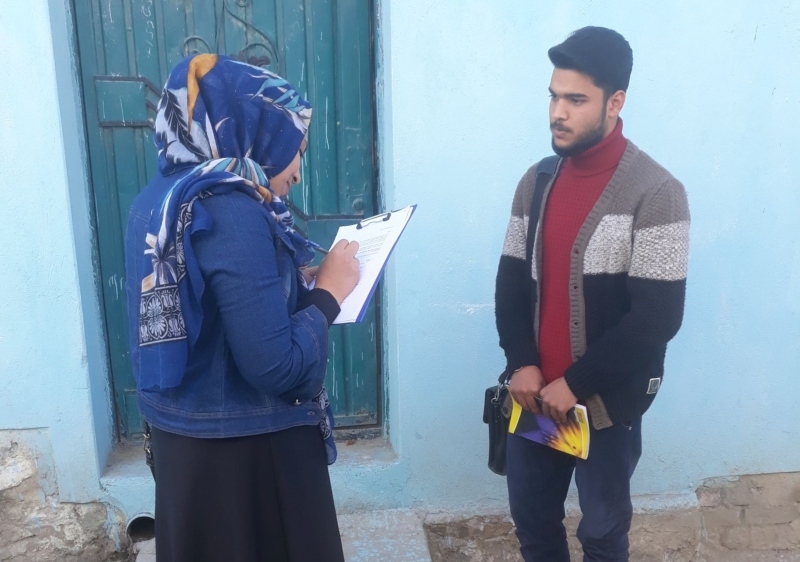 Working with him, we’ve mapped the key actors and stakeholders within the SHAHAR project, Kabul Municipality, the Afghan Deputy Ministry of Municipalities (DMM), local civil society groups, Afghan’s ecosystem of innovators and technology companies, and made contact with each. 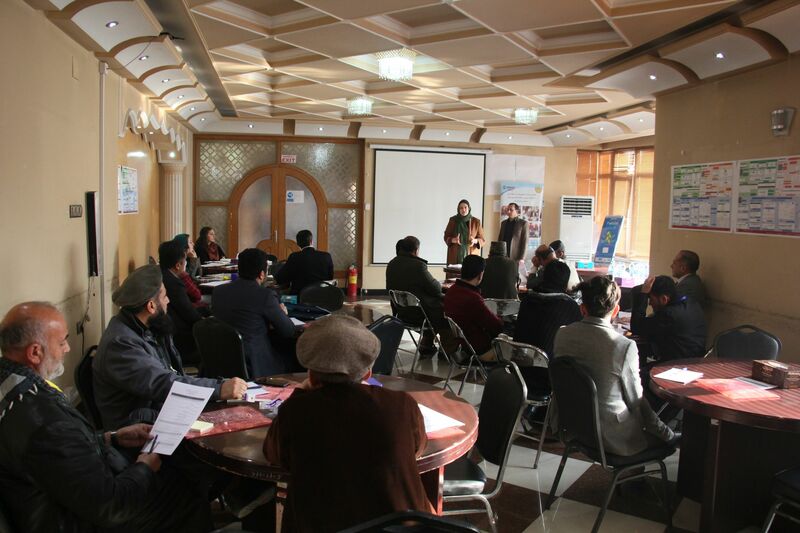 Subsequently, we carried out Frontier Insights research with citizens across 15 of Kabul’s 22 districts, and hosted a design-thinking session to bring together our stakeholders and to surface specific ideas for the app’s appearance, content, and functionality. With this information, we put together a design proposal that will be shared with all the same key actors to get feedback, buy-in, and a feeling of ownership of the process. Once we’ve made adjustments based on feedback from stakeholders, we’ll hire a hire a local software developer to customize the open source code accordingly. Taking a step back, Frontier Insights is a key component of our design approach. It helps us understand how citizens communicate, how they seek and share information, how they use technology, and gives us a sense of what they expect from their municipal authorities. 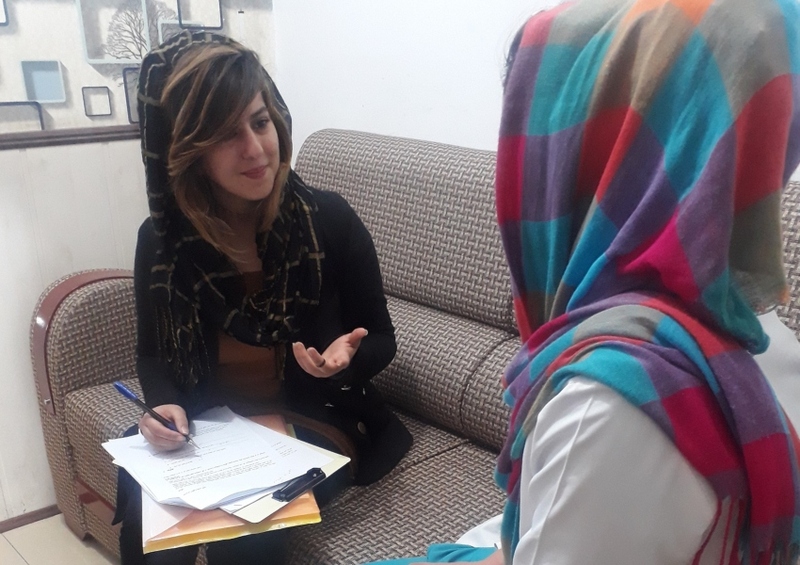 In Kabul, we carried out 120 interviews-including 70 men and 50 women. 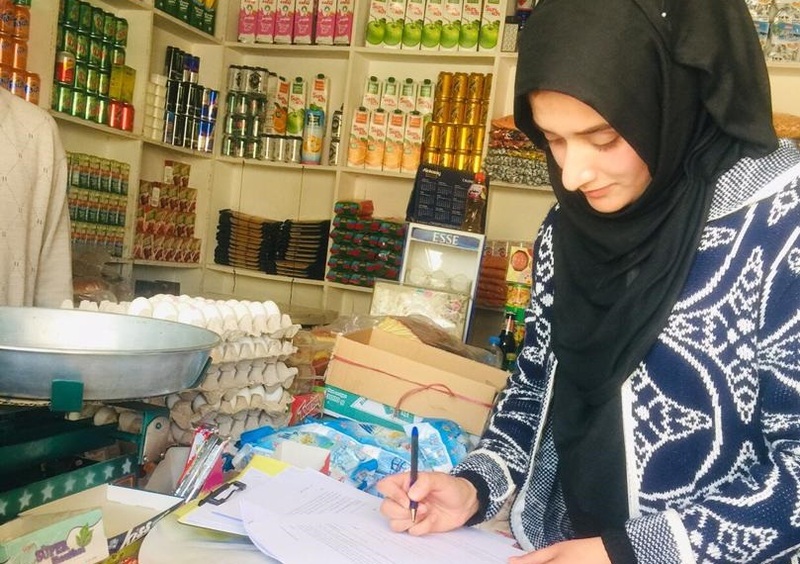 We made a push for gender equality, which is a challenge in a place where women are less likely to agree to be interviewed in the street, and if they do agree, would prefer to be interviewed by another woman. We accounted for this challenge by building our interview team of both men and women. While the interviewees did not turn out to be 50/50, we’re happy with the result. In terms of geographic diversity, we interviewed people in 15 of Kabul’s 22 districts. Once again, we didn’t hit them all, but we gathered a broad sample. Is the data collected a scientifically representative sample of everyone in Kabul? No, but keep in mind that Frontier Insights is designed to help us make early decisions in our design process; we’ll keep researching, iterating, and improving our solution throughout the process through our design-thinking sessions and user testing. This is the difference between design research and, for example, research for monitoring and evaluation. Some 97 percent of respondents have a mobile phone of some type and 56 percent have a smartphone. This gives us confidence that a smartphone app will have an audience, but it also pushes us to think about how a simple text-messaging component might complement the app to help the municipality reach those who do not own a smartphone and vice versa. Among our respondents, almost everyone said they get their news from television, while about half said they use the radio and Facebook on their mobile phones for news. This gives us an idea of how to reach people when we get to the promotion stage. It’s also interesting to see Facebook rival radio as the second-most popular news source. This is the case in many of the places where we’ve carried out Frontier Insights research. We asked our respondents to name their three favorite apps. Unsurprisingly, their favorite app is Facebook, followed by—surprisingly—Viber. In most places we work WhatsApp is a close second, but in this case it dropped to third place followed closely by Messenger, and Instagram. Our respondents also reported using Facebook an average of 77 minutes per day. Based on these findings, we’ll be looking for ways to help Kabul promote the app via Facebook, Viber, and Whatsapp, but also look for some simple ways to integrate our app with these popular social tools. We designed something similar with the Guatemalan version of MiMuni, where citizens are able to share what they find in the transparent budget section with their friends via messaging apps or post them to Facebook. The property tax, or safaye, was by far the most common reason people cited for visiting the municipality. Respondents also mentioned visiting the municipality to get a business license, an ID, and housing documents. Based on this, we’re exploring the challenges of making safaye payments through the app to see if it will be possible. Separately, we’ve been told that the business license process will no longer sit with the municipality, so we plan to provide some information about how to get the license in the app, rather than a fully digital license process. Of our 120 respondents, only 29 reported previously submitting a formal complaint about a local issue (bad roads, trash pick-up, etc…) to their municipality. Of those 29, only five felt that their issue was resolved. Improving citizen engagement is a core objective of SHAHAR, as part of our design process we’ll be working with the project team to incorporate a feature allowing citizens to send issue reports from the app, directly to the back-end system SHAHAR is already building with municipal staff. Our goal is that municipal staff will treat app-based reports the same was as reports shared in person, over the phone, or any other way. We ran these sessions much the same way as the workshops we facilitated in Guatemala last year. We had small groups generate and vote on ideas, present those to the full group, and then had the full group vote on the best ideas. Beyond the opportunity to surface ideas from the bottom-up, we view these sessions as a chance to have the actors and institutions to meet each other face to face and understand each others’ interests and preferences. Like Frontier Insights, the suggestions or ideas we collect are not definitive; instead, we triangulate and put together a draft concept that will pass muster for our own gatekeepers within the SHAHAR project and the municipality (principally the mayor himself, who is only one voice, but an important one), and that-based on our interactions-citizens will find useful. Our design thinking session at the SHAHAR office. In terms of appearance, we’ll use the municipality’s current color scheme, dark blue and gold, as a base, but we also wanted citizens to make suggestions for additional colors. While this may seem trivial, we view it as a simple way to directly incorporate feedback and ideas from citizens that will be highly visible in the final product and generate ownership. 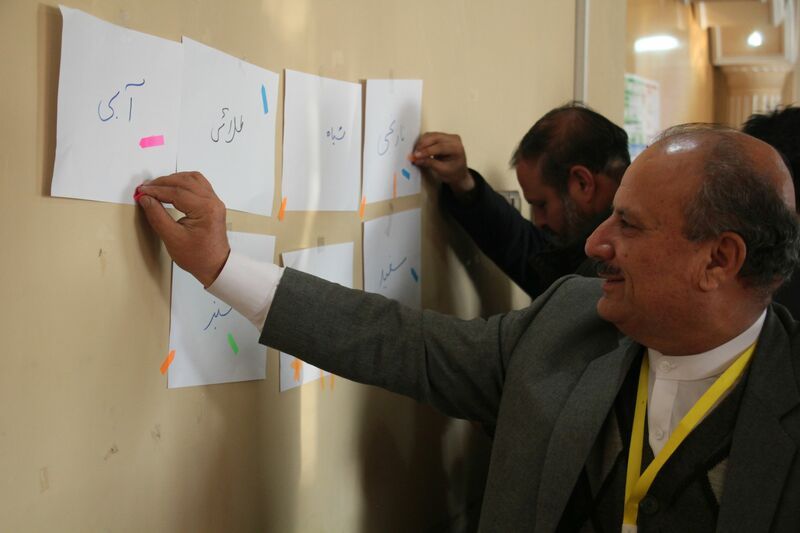 At the end of the design-thinking sessions, the participants chose orange and green as accent colors; orange for the color of the vests the municipal employees wear, and green to represent vegetation. Eventually, we’ll have to think of how to artfully incorporate these with a base color scheme of blue and gold. 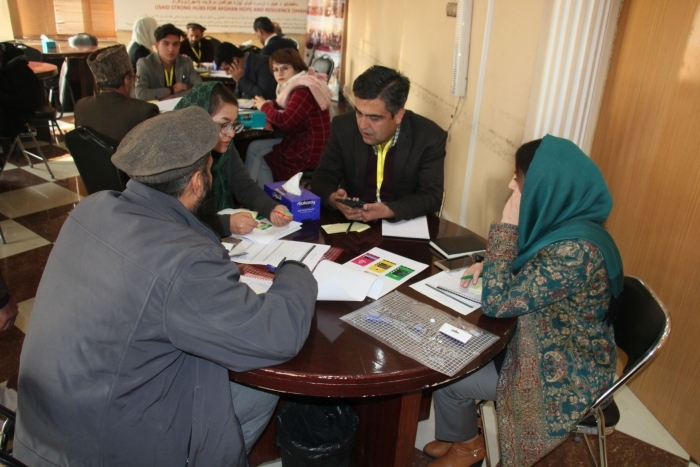 Participants discuss their ideas for the Kabul app. A participants votes on ideas during a plenary session. In terms of functions, participants asked for the ability to share reports directly to the municipality, but also to get feedback and status updates on their reports. They wanted a safaye and business tax calculator, the ability to pay the tax directly, and access to municipal job listings. 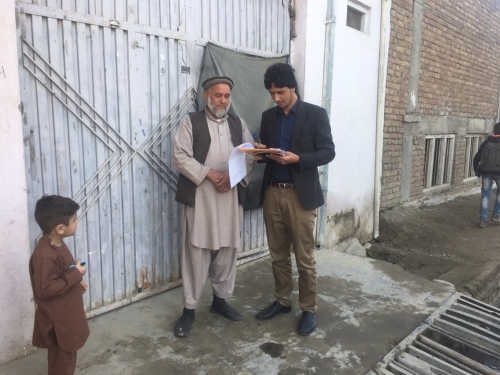 As mentioned above, we are confident that we’ll be able to integrate the app into the citizen reporting mechanism that SHAHAR is developing for Kabul. We’re also confident we can put together a tax calculator. The municipal job listing will depend on the current processes for posting jobs online and if there is already a place where this information is available. As for the safaye payment component, as I mentioned, we’re exploring this component’s feasibility. UN HABITAT is building a database of citizens and safaye payments, which we would need to leverage to build out the payment’s feature, but as of today we’re not sure when it will be ready or if it will be connected to the internet. Based on the results from Frontier Insights and our design-thinking session, we’re putting together our design proposal and preparing to socialize it with key actors. In the next week or so, we’ll finalize our design and get started with the process of hiring a local software developer. At the same time, our local project manager is beginning his engagement with the other four provincial municipalities, where we’ll conduct Frontier Insights and host design-thinking sessions so we can develop their municipal apps as well. We expect to finish the development of the Kabul app and the four provincial apps by October, and possibly earlier, since we’re starting with pre-existing source code, depending on user testing and approvals. We’ll keep you updated on the progress of our process!